Monday 14 December. Wow, already 12 weeks away from the demi-marathon, so I am officially starting Hal Higdon’s Half Marathon Training Program (novice level, of course!). I started to follow this program in November, so am not entirely a novice, but so what. Off to a great start… again! Monday is stretch-strengthen so I did 45 minutes of stretching/yoga and light weights at the noon hour. Tuesday 15 December. Burr – sunny but really cold outside! Did a 5K run in 35 minutes in the sunshine at the lunch hour. Freezing! Felt really good though, all in all. Wed 16th – had best intentions but never made it out for a run. Oh well. It snowed nonstop for most of the day today. I really needed to run but was not about to do it in this weather. So I decided to see if I could get a free test drive at the sports club across the street. This is the same gym where I was a member for a year up until last month. No one contacted me to renew and I was happy to let it drop, thinking I could manage with yoga classes at Red Earth Centre & outdoor running at the track, but then winter hit. Hard. Today. So posing as my sister, I called the Cercles de la Forme sports club and booked a guest pass. Thankfully the guy at the counter was new or didn’t recognize me, so I was in. I ditched the rendez-vous with the coach (who was nowhere to be found anyway), grabbed an open treadmill and did 4.3 K in 30 minutes, followed by a 1 hour body balance class. After freezing my arse off the past few days I was sooo looking forward to spreading out in the sauna to relax and let the heat penetrate my skin. But the sauna was unusually busy and full of chatty women. Two of them joked (or not) that they had been in there for hours!! Another woman was taking an informal poll as to why we were members of the gym and if we came often. Was it to ‘lose weight’ or to ‘build muscle?’ she queried. Most of the women said ‘both’ and that they came 2-3 times per week. She went on to inform us that she was an ancienne obese who had lost 25 kilos (about 50 pounds) in 4 months. I wondered if the other women were friends of hers, or if she was always this candid. In general, I cherish impromptu occasions to chat and swap anecdotes with strangers, especially in Paris. These are succulent moments that let you get closer to the culture. Given this garrulous group and the uniquely intimate setting – we were all stark naked and light-headed from the heat – this exchange had the potential to be extra juicy. I considered confessing being a former gym member turned stowaway who was training for a half marathon but couldn’t face the cold. But 5 minutes in the sauna is my limit and I had already exceeded it. A cool shower was beckoning. Congratulating my sauna mates for their stamina, and hopped down from the upper level towards the exit. One of them said I looked as though I was a regular who could handle much more than this, which was flattering and somewhat surprising. On the rare occasions when I find myself naked in front of strangers, my natural tendency is to shrink, hide, or cover up. But all this running lately has boosted my self-image. I thanked her and stood up tall as I headed towards the showers. The sneaking in may have brought an additional level of satisfaction to my afternoon of fitness, but nonetheless it was a great experience. I might cave in and renew the membership after all! Sunday 20th – Slept shamefully late and wasn’t in the mood to run at all. I only had a few hours before the Grease matinee at the Palais de Congres near the Porte Maillot, so Jorge & I decided to walk there. 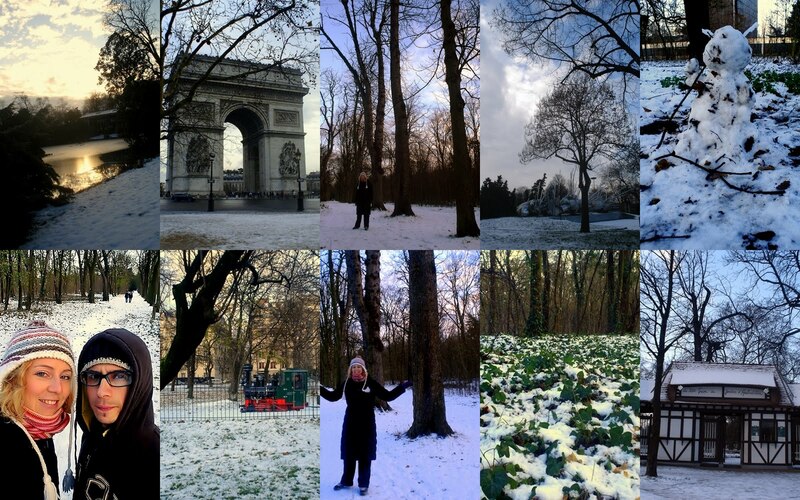 We left the Porte de Clignancourt and walked all the way to & around part of the Bois du Boulogne. Once we finally got off the main roads, the woods were simply enchanting. There were dirty mini- snowmen and ducks diving into frigid creeks. I felt like we were miles away from the city in a winter wonderland. 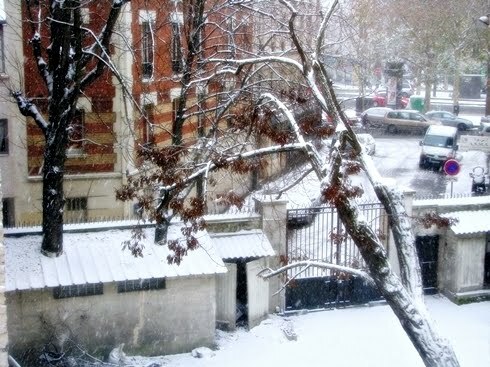 If I had had better gloves, I would easily won the snowball fight initiated by my Colombian boyfriend who, after seeing snow for the first time in Paris in 2007, was inexperienced in turning snow into a potential weapon. But my hands were already freezing cold not unlike the rest of me, and I didn’t want to make it worse by getting my gloves wet. 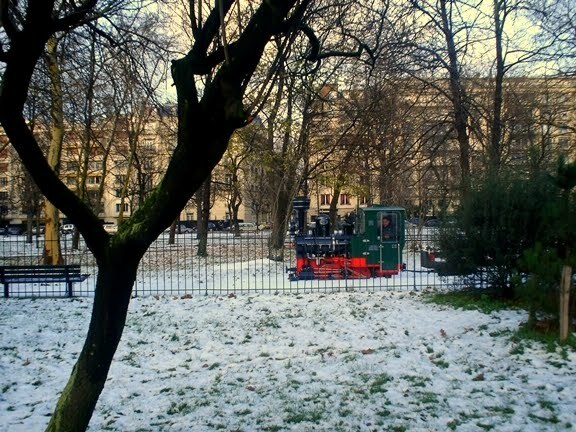 So I savored the tranquillity of the quiet walk, interrupted only by the occasional gentle smack of a feeble snowball hitting my coat, the ‘crunch crunch crunch’ of our footsteps, or the whistle of the empty little train, beckoning us to hop aboard for a ride around the park. 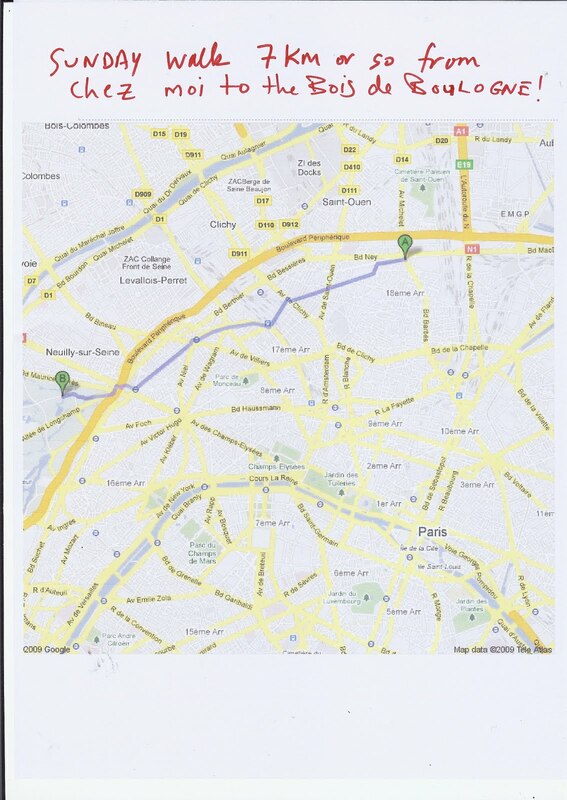 But we continued on foot till we got back to the Porte Maillot… all in all about 7 km. This entry was posted on 15 December 2009 by ladymissmba. It was filed under Half Marathon training 2011 .